It's one of the most charming anime of 2014 and educational to boot. It's an anime about making anime. The cast all work in Japan's anime industry, most of them in a company called Musashino Animation. Several things will be immediately obvious. (a) It's a brutal, brutal industry, with people putting in ridiculous hours and half-killing themselves to make a fully animated episode each week. (The industry has a recruitment problem, by the way. People don't want to work those hours for the fairly poor money on offer.) Unsurprisingly, this yields oddballs. Some are geeks. Some are idealists. Some got crushed by colleagues who didn't care about quality so long as it got done in time. The vast majority, though, are insanely passionate about their work and will fight like mad dogs to achieve what they're looking for. (c) There's nowhere else like it. Everywhere I go, people say this show is practically a documentary. The anime industry really is like this. What's more, its cast aren't just representative of certain character types, but actually based on real people in the industry. This includes wildly defamatory ones, e.g. Chazawa. (The original complaimed on Twitter.) The show's voice actresses look like the real voice actresses who played them, have almost identical names and include references to their more colourful traits. That reference to one of them as a hard-drinking party girl in ep.2? Yup. That. Meanwhile the universally despised idiot, Taro, is a self-portrait by Shirobako's director, from when he was younger. Hiromaso Ogura did the backdrop in ep.19 that's being painted by a character based on him. It's fractal. The more you learn about this anime, the more meta it gets. Best of all, though, Anno Hideaki shows up! Okay, this fictional version is called Kanno Mitsuaki and played by someone else (disappointingly), but it's obviously him. I was in stitches. The only anime trend I can think of offhand that they overlooked is Korean outsourcing, but in fairness I don't think PA Works (the studio behind this show) outsourced to any Korean companies when making it. You'll howl. You'll laugh. You'll be petrified at all the different ways in which an anime production can run head-on into a speeding train. You'll see them go through so much hell trying to make an original story that surely adaptation must be the only way to go, but then later you'll see all the headaches involved in adapting a hit manga and become convinced that the only option is an original story. There are five main characters. Aoi Miyamori, Ema Yasuhara, Shizuka Sakaki, Misa Toudou and Midori Imai once made a short film together as part of their school anime club. Today, they're trying to make it in the business. Miyamori is on the production staff at Musashino and the main character of Shirobako. Yasuhara is an artist, Sakaki is a voice actress, Toudou does 3D computer graphics and Imai is a wannabe scriptwriter. These five girls take us into different production departments and keep us connected with the show's various problems, although of course the number of people we eventually meet is huge. Lots and lots of people do jobs you won't have thought about in making an anime. It's educational. I kept having my eyes opened to angles I hadn't considered, even though in hindsight they're obvious. The sound department have a far harder job than they would on a live-action TV show, for instance. Every sound has to be made by hand. If someone walks down a path, you've got to go out and get it... and if the colouring department hasn't done the scene yet, you can't tell whether it's gravel, shingle, pebbles or whatever. I loved the scene where Miyamori gets shanghaied by a sound editor and he's lecturing her on the characterisation he needs in her footfalls. That's the best thing about this show all over, in fact. These people really, really care. It's a joy to see, for instance, the background painter practically turning himself inside out on how to render clouds. The voice acting was another eye-opener, by the way. I've always hated English dubs of anime, although I understand they've improved in recent years, and Shirobako showed me why. A typical English dub will be done cheaply, quickly and all in one go. One or two days. They'll line up all the episodes and blast through them. If you consider how long it takes just to watch all of a TV show, you'll get some idea of how breathless that is. The original Japanese dub, on the other hand, is recorded week by week (i.e. it lasts three or six months) and approached like any other proper acting job. So many actors get auditioned that the production staff's ears are almost bleeding. They'll spend plenty of time in the studio working with the actors on subtleties of performance and characterisation. The cast inhabit their roles for months, not days, and work hard on getting inside them. Of course that's going to be better. Occasionally the show gets a little playful with its reality. I'm not talking about the semi-parodic titles of other anime shows... although those are funny, "e.g. My Harem Might be Falling Apart, but I Guess I'm Just Imagining Things". No, I mean the very occasional whimsical bits where the show starts presenting its characters heroic struggles as a Western at high noon, a multi-vehicle chase scene or whatever. These are great. 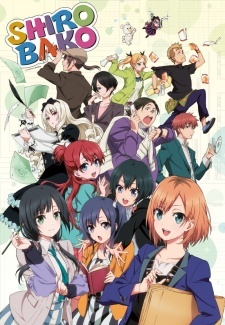 You could argue that they're the subjective viewpoint of eccentric and highly stressed characters who live and breathe anime, or alternatively you could just see it as Shirobako playing with anime conventions for laughs. I'm happy with either reading. It doesn't really matter. Oh, and the meta goes the other way too, to the show-within-the-show being made by Musashino. The inner fiction is capable of being a thematic mirror or a metaphor for the real lives of the Shirobako characters. Ep.23 nearly brought me to tears. I love these people. I love how deeply they get into their work. I love the way they can get fired up discussing their fictional characters' favourite foods, or how a voice actress can ask about her character's blood type and then be disappointed when no one knows. I love whatshername practising embarrassing dialogue on the train and not even realising that a normal person might be self-conscious. I love the fact that despite all the chaos and screw-ups, collectively they're brilliant at what they do. When Fatso brings production to a screeching halt, he's got something in his head that had shot way over mine... and he's right. He makes it better. I love the note-perfect 1970s theme song for Andes Chucky. I love the newbies in the second half of the season being surprised that Miyamori could ever have messed up. I love the things I learned about how to express character in both 2D and 3D animation. Recommended to anyone with an interest in the animation business or TV production, or perhaps just enjoys watching lovely and hugely entertaining anime.